Broadway Joe still has a hold on the Big Apple. The kid from Beaver Falls, Pa., who turned into a legend both on and off the gridiron, got his latest honor from his adopted hometown of New York City. Gray Line New York honored Joe Namath with induction into its Ride of Fame, a series of mobile monuments celebrating the endeavors of exemplary New Yorkers. Namath personified exemplary in his hay day putting together a Hall of Fame career with the New York Jets and living a Big Apple lifestyle with his Upper East Side bar and his television and movie career. 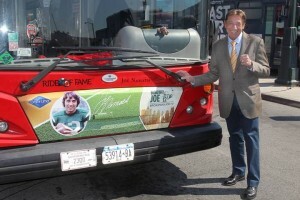 Namath, now 69, was still exemplary on this particular mid-September morning at a ribbon-cutting ceremony to christen the red Gray Line New York double decker bus that now bears his likeness. He did everything asked of him -- he shook hands, he posed for photos and he said a few words to the crowd in that drawl that made him famous. Even in all of that commotion, Namath took a little time to talk Alabama. Not the Alabama he knew when he won a national championship under the "Bear". He wanted to talk about the previous week's game against Western Kentucky and how the offensive line needs to do a better job protecting A.J. McCarron. Taking in Namath's postgame analysis was UANYC's own Christopher Hollinger. Hollinger slid away from the office for an early "lunch" and made it over to Pier 78 to support an Alabama great and show his Tide pride. When Namath recognized Hollinger's Alabama elephant lapel pin, he was more than eager to walk over and talk about his alma mater. The two chatted about football, the chapter and everything going on with the day's festivities. Just like two friends catching up. "It was just like talking to anybody else," said Hollinger. "He was very down to earth, very engaging and very gracious of his time with everyone who was there. I was impressed." Impressive is something Broadway Joe has been for decades. It is nice to know that he hasn't lost his small-town charm....or his love for the Crimson Tide.